Holidays to the western coast of Australia and Perth offers a starkly different experience to those cities and resorts found on the opposite side of the country. This modern, capital of the region is located on the scenic Swan River and is just a short distance from the coast. A great many hotels and resorts are actually located on the beaches to the north, which provides access to the Indian Ocean. Perth has a climate similar to that of a Mediterranean-type: wet but generally mild winters, while the summer months are hot and dry. Between November and April, temperatures average 30°C, but can leap as high as the low-40s. For warm yet pleasant conditions, springtime (September to November) and autumn (March to May) are arguably the best times to visit. 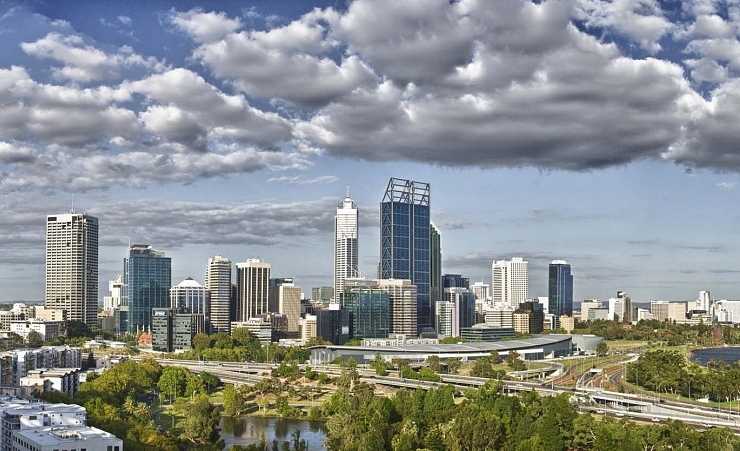 Kings Park and Botanic Garden is the jewel in Perth’s crown. Perched next to Swan River, the 17-hectare Botanic Garden sits at the centre of the park and contains 2,000+ plant species and wildflowers of the state (if you’re there at springtime). A day at the zoo is always heaps of fun, and Perth Zoo has sights like no other. The ferry ride across the river is a highlight on its own. Heading through the Reptile Encounter, African Savannah, Asian Rainforest and Australia Bushwalk – at the end of which you’ll have confronted cheetahs, rhinos, elephants, tigers, kangaroos, emus and koalas – are memories you’ll cherish for the rest of your life. Perth is home to some of the best beaches in the world, where you can watch the sunset over the Indian Ocean on the ‘Sunset Coast’, surrounded by golden sands and warm sunshine. Sorrento Beach is one of the best-known beaches of the area, although the turquoise waters of Cottesloe Beach are the safest for swimming. A cosmopolitan city that offers a plethora of restaurants sure to satisfy any craving or desire. Be sure to check out the local fare in the form of Western Australian produce that Wildflower has on offer. For more international choices, Brika does great Greek, Middle Eastern cuisine can be gotten at Meeka and Long Chim’s Thai comes highly recommended. For something more romantic and quite breath-taking, the 3-hour Swans River cruise and sumptuous buffet are hard to beat. There are pubs and bars scattered throughout the city, but the CBD area, particularly during weekends, is where most of the action is taking place. Alternatively, the bars and clubs in the Northbridge area are now popular and enjoyable, where once this area was frowned upon a little for it’s rough-edges. The Art Gallery of Western Australia, Perth Institute for Contemporary Arts and the Western Australia Museum are just some of the many, many attractions found with the Perth Cultural Centre. One of the main highlights is the Art Gallery of Western Australia, which displays an excellent art collection. Also worth checking out is the Bell Tower, which houses the 500-year-old royal bells of London's St Martin-in-the-Fields; the peak of which provides stunning panoramic views. Aquarium of Western Australia’s 98m underwater tunnel lets you observe a spectacular array of fish, sharks and turtles. If you’re feeling brave, you can even join the dive master and swim with the sharks. If you’d prefer to keep your distance from the local sea life, the whale watching tours may be more suited to your reserved levels of courage. Or if you prefer your adrenaline to be spiked by exercise instead of fear, there are a number of good bike tracks and cycling routes that provide a great way to explore the city. If bikes aren’t your thing, there is public transport in the form of buses, trains and ferries, including a Free Transit Zone. Car and moped rental are a good option for those who wish to have more control over their own schedule.